Sick of all the materialism of the holiday season? Many families are eager to inject more meaning into their family traditions. Activities such as serving a meal at a soup kitchen or buying toys and mittens for children in need are always great options, but they aren’t the only ways to focus on the people and issues that matter to you. Here are five small ways to step back from the presents and the products, and focus on the true joys of the season. 1. Make room in the toy box. Enlist your children’s help to clear out toys, games and clothing they’ve outgrown. Box up items in good condition and donate them to charity. Clearing out the old will help cut down clutter, give your children a clearer picture of how fortunate they are and help them learn the value of giving to others. Share your favorite holiday memory. Read aloud together from your favorite book. Make a list of New Year’s resolutions for the whole family. Make handmade cards or gifts for your children’s teachers. Make a list of places you can volunteer or charities you can support in the coming year. 3. Give gifts to wildlife. After your holiday meal, take a family hike – and scatter birdseed along the trail as you go. Moving outside together is a great way to step away from the gift grab, connect with one another and work off that extra helping of stuffing. And your feathered friends will appreciate their own holiday feast. 4. Write a letter. Who doesn’t love a handwritten note? Decorate cards and write letters to faraway family members, friends or soldiers stationed overseas who might be feeling lonely during the holidays. Crafting cards is a fun art project for the littlest kids, while older children can pen their thoughts and well wishes. 5. Cook up a new tradition. Special foods are often a part of the holidays, and making them together is a great way to enjoy the season. While great-grandma’s legendary pecan pie will always have a place at the table, it’s fun to add new taste traditions, too. Choose a variety of new recipe contenders, take a family vote, and let everyone have a hand in measuring, stirring, cooking or baking. While you’re at it, set aside a batch to share with shelters, local firefighters or other community members who you want to thank. Their gratitude will be well worth a batter-splattered kitchen. 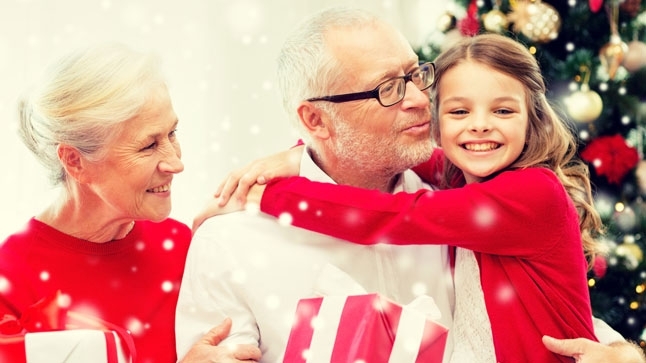 For more happy-holidays advice, check out these strategies for avoiding family friction.